Mornings can be crazy. After attempting to wake up, get yourself ready, get your kids ready, get out the door with all books, projects, and lunch boxes, breakfast can be an after-thought to say the least. We get it, we are guilty of the "half a pop-tart on the way out the door" too. But, as cliche as it sounds, breakfast really is the most important meal of the day! It kick-starts our metabolism, prepares our digestive system, and fuels us for the day. We have prepared a list of quick, easy, and healthy breakfasts you can prepare in a flash to get you on your feet and out the door with a little extra pep in your step! Oats are an excellent source of fiber and a great breakfast option to keep you full and satisfied until lunch time. But, who has the time or patience to monitor a boiling pot in the midst of the usual morning chaos? Overnight oats are prepared the night before and steep in the refrigerator all night long so you don't have to do a thing except eat! Here's how: Take a bowl or jar and add oats, a milk of your choice (we are loving cashew milk right now), chia, flax, sunflower, or pumpkin seeds, a drizzle of honey or maple syrup, and your favorite nut butter. Give it a stir, slap on the lid, and pop it in the fridge! In the morning you can top with your favorite fruit, or enjoy as is. We are all about the smoothie bowl trend! Chock-full of vitamins and antioxidants, these fruity concoctions add a fresh flare to your morning routine. We love how you can customize each bowl for a different taste every day! Plus, you can multi-task while you whip these bad boys up in the kitchen to maximize your time in the morning while still leaving the house with a full and happy belly. Check it out: Stock up on fresh fruits at the grocery store so you have options for variety and flavor (be sure to include a banana for each day)! Separate your fruits by day, being sure to cut off all stems and peels, then toss them in a baggie and into the freezer, labeling each day for convenience. In the morning, throw your fruits for that day into the blender with a splash of milk of your choice, your favorite nut butter, and a drizzle of honey (feel free to add vitamins or proteins in their powder-form here for an extra boost of nutrients). Top with more fresh fruits, nuts, seeds, and shaved coconut, and be on your way! You can also peep these recipes for slightly more detailed options. Who doesn't love a delicious breakfast burrito? The ultimate feel-good breakfast that seems to fuel the heart and soul. The best part about burritos is that there really are no rules. You can pretty much put anything you want in a tortilla and call it a meal. But, in effort to keep us fueled and healthy all day, we're loving tofu black bean breakfast burritos! How to make it happen: Meal prepping is key here. Make your burritos over the weekend, wrap 'em up, and stick them in the freezer for ready-made breakfast all week long for the whole family! Cook your tofu (or buy it ready-made, we won't tell), scramble some eggs, boil the black beans, and quickly sauteé some onions (and any other veggie you like). Wrap it all up in a tortilla of your choice, roll it into some foil, and pop in the freezer! In the morning, unwrap the foil and throw it in the microwave, and voilà! A tasty and nutritious breakfast in a jiffy. 4. Get creative with toast! This is one of our very favorite breakfasts because it gives us a chance to express originality through our food first thing in the morning! From savory to fruity to sweet, and everywhere in between, you can create toasts with enough variety and flare for weeks. Keep it simple, or go crazy with toppings! Either way, you'll boost your metabolism and be out the door in a flash. 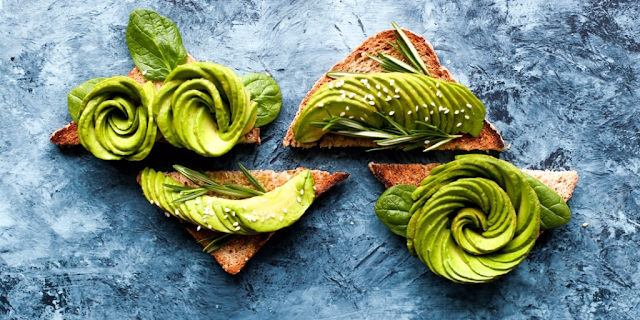 Some of our faves: We have an undeniable sweet tooth, so we love coming up with toasts that satisfy that sugar craving, but are still healthy and filled with body-nourishing benefits. Try a slice of whole wheat bread, spread with almond butter, top with sliced bananas, drizzle with wildflower honey, and sprinkle with cinnamon. Who says you can't have dessert for breakfast when it's filled with vitamins and minerals?! Are you more of a savory-seeker? We also love 9 grain toast, spread with goat cheese, topped with heirloom tomatoes and an egg, and a drizzle of balsamic vinegar. Tap into your toast inspiration here. No matter what your palate craves, there is a healthy breakfast option for you that will have you looking forward to your morning meals instead of skimping out on them! Empower your mornings for yourself and the whole family starting with breakfast. Tell us your favorite healthy breakfast go-to's in the comments below!